InspirAsian Dance were guest performers as part of a Bhangra Band on the main stage. Taking the lead from Judge, Biri and Harvey, this was a lively performance encouraging audience participation! "It was amazing meeting you guys and having fun at Port Eliott. That was a fantastic night and the dancing was really great!" InspirAsian Dance perform and lead workshops, for all ages, rain or shine daily! The children's area is organised by the wonderful 'Rogue Theatre' who put on an array of magical entertainment and activities. "It was amazing how many people got up to have a go. The engagement and interaction between you and the audience was really good." Charlotte worked with three Schools teaching different dances to each School, to be paraded through the streets of St. Just. 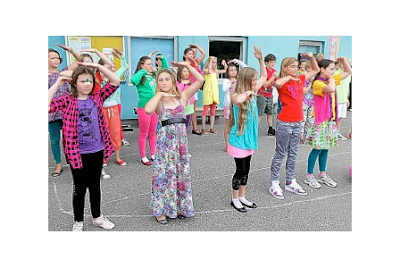 In the order of the video: Pendeen, St. Levan & St. Just Primary Schools performing Bhangra Dance through the streets of St. Just, Cornwall. Tamsin Young, organizer of La Frowda: "THANKYOU for a fabulous job at Lafrowda.The schools are all delighted with their Bollywood dancing, your approach to each school was great, as was the music." Each class had a different animal theme. With a mixture of taught steps and creativity from the chidren, a colourful performance was produced. "You did an amazing job and everyone was really impressed with what you achieved in such a short space of time."